Infants and young children are a unique population that requires special knowledge, skills, and experience. Topics related to serving pediatric populations from birth to age 3 and their families will include navigating Part C of IDEA, understanding different service delivery approaches and settings, building family capacity, and assessing and treating complex communication and swallowing needs in low-incidence populations. We estimate that you'll be able to earn as many as 2.6 ASHA CEUs (26 professional development hours) for this event. Get CE details. "Attending" an online conference allows you to listen to 1-hour sessions at your leisure and participate in pre-scheduled live chats with presenters. You'll also have access to discussion threads, handouts, and other resources. Interact and network with speakers and colleagues without traveling anywhere; all you need is an Internet connection! More about how online conferences work. Sorry, we cannot accept purchase orders for this conference. Your written notice of cancellation will be accepted for a refund of registration fees less a $50 processing fee if received on or before May 1. 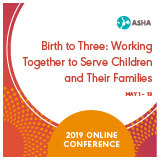 To cancel, e-mail coursecancellations@asha.org with the subject line, "Birth to Three: Working Together to Serve Children and Their Families cancellation." Cancellations received after May 1 will be refunded less a $75 processing fee, and no continuing education credits may be earned for the conference. Cancellations will not be accepted after May 13. Cancellation fees are processing fees and cannot be waived. Paid registrants can log in beginning May 1. Go to My Account in the upper right corner and enter your username and password. Under "ASHA Courses and Orders," select the name of the conference. Problems accessing the online conference? View our Technical Tips.